Week One Done and Dusted! [#] A little help please, MG.
Wow, did that week go fast or what! I will be summarising my thoughts about the week here on a regular basis and also posting Literature Journal Topics for all the units mentioned above. Critical: Give your personal response to the opening pages of Dead Man Dance. What do think about this writer's ability after our intensive session on it today? Creative: Write a short paragraph in the style of Kim Scott describing a scene or event that means much to you. Use some of his tricks of word choice (in meaning and sound). Use also his way of getting inside a character's experience through fragmented language. Creative: The Mountain Has Its Own Meaning. What did this idea make you think about your own relationship to the Australian landscape? Do you have any thoughts about how you/ we should be relating to the landscape around us? Critical: Write a brief appraisal of some of the paintings you saw today: David Boyd's Mad Hatter in the Australian Landscape; John Glover's "My House and Garden" or Eugene Von Guerard's "Weatherboard Falls". What did any of these paintings make you think about the artist's attitude to the landscape. Creative: Create a topic of your own that connects in some way with the themes of today's classes. What do you think Conrad means by this? Using some of the techniques you have discovered in Hopkins’ amazingly original use of words write a short poem that captures your own awe at some phenomenon in nature. Creative: Write a short letter to either Conrad or Hopkins thanking them for the way their writing has opened up a new way of looking at the purpose of creative expression. Critical: create a mini web resource file (possibley containing videos or reviews or interviews and images) for either Conrad or Hopkins. Don’t forget that in your literature journal blog space you are liberty to create your own responses to the literature and ideas we have been studying. You are also permitted to base it on your own experience. Please remember to write well, to edit your work and in your peer reviews, always be courteous, supportive and constructively critical. 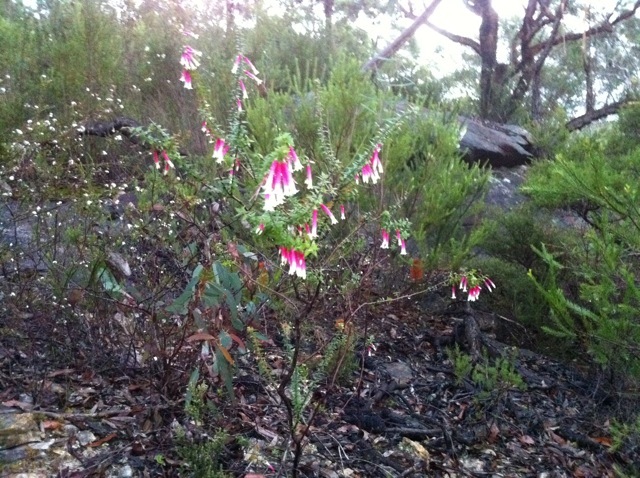 Picture below taken on a bush walk recently.... spring is alive and well. These are some of my favourite "Native Fuschias". A little help please, MG.
Re: A little help please, MG.